Roaring Currents is the big screen treatment of Admiral Yi Sun-shin and the Battle of Myeongnyang, when he commanded a small fleet of 13 ships to victory against the Imperial Japanese navy’s 333 vessels. Following a number of successful campaigns, Admiral Yi was stripped of his title when he refused to follow orders that he deemed reckless. After a crushing defeat that saw the Korean fleet all but decimated, Admiral Yi was reinstated, faced with the daunting task of guiding a small group of warships into the battle against the mighty Japanese fleet, led by the ruthless Admiral Kurushima. 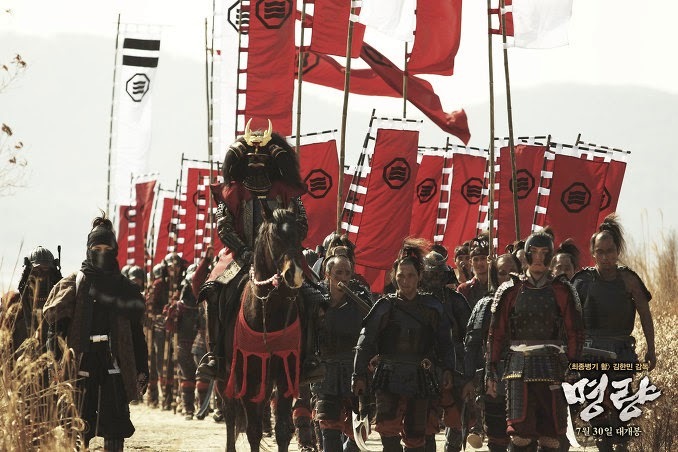 Yi Sun-shin is one of Korea’s most celebrated historical figures and the Battle of Myeongnyang one of nation’s proudest moments, but before now it has never been memorialized on film. The simple reason for this is that before 2014, the Korean film industry wasn’t equipped to realize a film on this scale, particularly one that would rely so heavily on visual effects. From a technical standpoint, Korean cinema has seen great advances in the last decade but it was only a short while ago that VFX became sophisticated enough to play a large role in feature films. As recently as 2006, The Host paved the way for advanced CGI in Korean productions (though back then VFX work was still being outsourced to foreign firms). Roaring Currents, much like last year’s commercial flop but technical triumph Mr. Go, showcases how far Korea’s visual technicians have come. Flurries of cannonballs and arrows soar through the air, over, between and through hundreds of intricately detailed 16th century war ships. The chaos of war is palpable, as bursts of splinters and tufts of smoke add texture to the dense topography of the battle scenes. 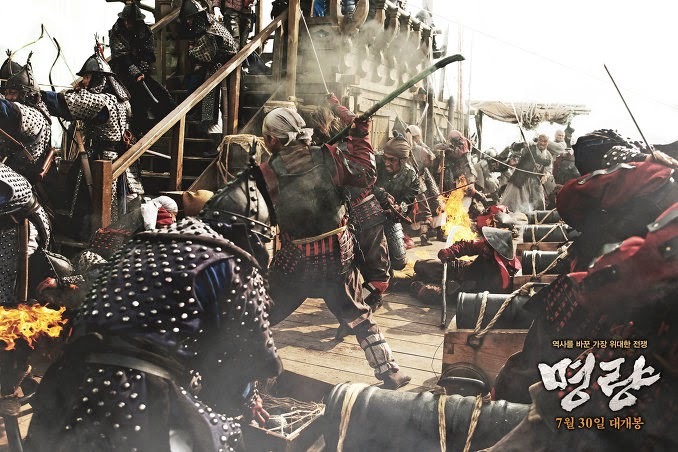 With so many moving parts, the film runs the risk of becoming a blur but director Kim Han-min, already experience in period action fare following 2011’s War of the Arrows, keeps the sprawling chaos tight and is able to guide us the through the complicated geography of the large scale naval maneuvers succinctly. While the film excels in the more complicated elements of its gigantic set pieces, there is the sense that this comes at the expense of traditional mise-en-scene. Compared to other local period films, such as Masquerade (2012) or The Face Reader, the cinematography here is nowhere near as crisp. When filming a crowded battle this may be a necessary evil but even in the quieter first hour, which sets up the battle of the latter half, the functional camerawork and editing leave something to be desired. Where the film does impress, beyond VFX, is in its crisp sound design and ornate costumes. Dense and immersive, the sound throws the spectator right into the thick of the battle, though at times some of the foley work, such as cannonfire, have noticeably been looped. The detailed battle armor costumes, ornate and detailed, are also an impressive sight. Some of the Japanese outfits go a touch overboard but are nonetheless exquisite. 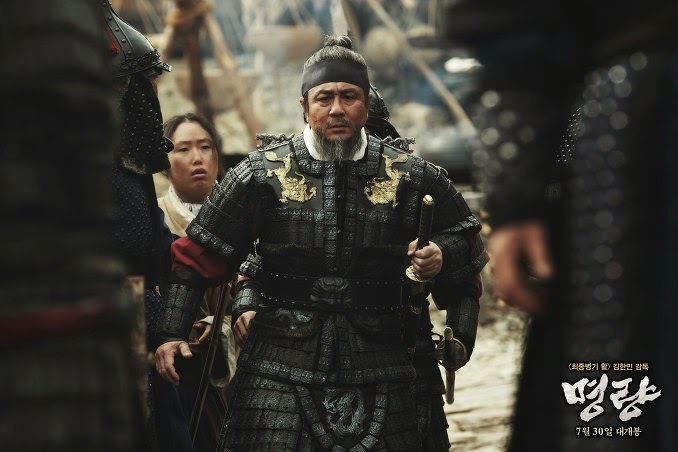 Standing tall as Admiral Yi is Choi Min-sik, likely the only star who could have filled such large shoes. With solemn gravitas and aided by a battalion of low-angle shots, the veteran ably strikes the hero pose that he is often called upon to do. Though he captures the Admiral’s legendary heroism this performance lacks the depth and nuance that has made Choi the respected thespian he is. Meanwhile, speaking only in passable Japanese and shooting daggers out of his eyes under his ostentation headdress, Ryu Seung-ryong emits a villainous air, but his is more caricature than a character. Writing as a foreigner (I say that since local viewers’ take on this film will likely be very different to my own) I feel I should point out the film’s excessive patriotism. 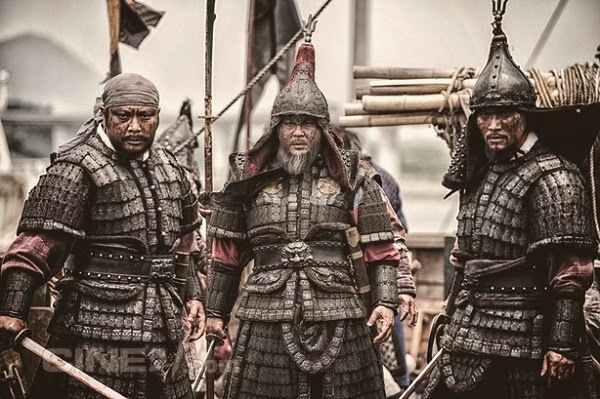 All of the Korean characters, down to small villagers, are portrayed as heroes and the film is littered with instances of extraordinary courage and sacrifice. On the flipside, Japanese characters are all portrayed as villains, not merely enemies. The only Japanese soldier shown in a positive light is one who defects to the Korean side. Perplexingly, the film features only one female character of any note, a mute woman who can only emit a tremulous wail in her most important scene. Navigating from a borderline tedious first half to the overweening nationalism of its bombastic crux, Roaring Currents is a formidable technical display sorely lacking in subtlety. However, in a country still reeling in the wake of the Sewol Ferry Disaster, it has turned out to be just the ticket for local viewers seeking a morale boost, as it blew almost every box office record to smithereens in its colossal debut.